First, a very personal note. I was with WRA for a while and the relationship didn’t quite work out; partly due to my personal outside issues with caretaking for my mother, who was in the final stages of Alzheimer’s Dementia. My mother, who was my best friend, confidante and inspiration for writing, passed away on April 3, 2010. Now, Easter has a very bittersweet meaning for me – chocolate bunnies can’t take this sting away. However, given that, I know what my mom would have wanted and that was for me to keep on writing whether it be on WOM or on Examiner.com (I have an anime/manga section out of the Santa Barbara, California bureau). 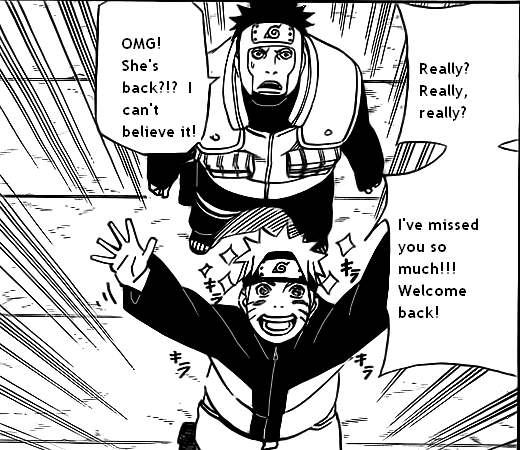 So, with Naruto 491, I am officially back and in prime form. And, to my former home on WRA: Yes, it is official, I am back. However, it is your loss…. Yeah, a lot happened during that past arc but this arc is promising to be even more excellent. Chapter 491 was, IMO, one of the most enjoyable in quite a while. There is a lot of jumping around but it all works. And, Tsunade? Well, I know how it feels to join in a conversation very late – and after some heavy duty decisions were made in your absence. She discovers that she slept a bit too long on the job. And, she’s as feisty as ever: calls the Tsuchikage “old man,” Gaara a “punk,” and speaks up for her strongest ninja, Naruto. Tsunade? Checkmate. Gaara? Methinks you need to revisit your immediate past about who saved your arse of late. Speaking of Gaara…he’s not on my most favorite Kage list these days. Why, do you ask? Simple. 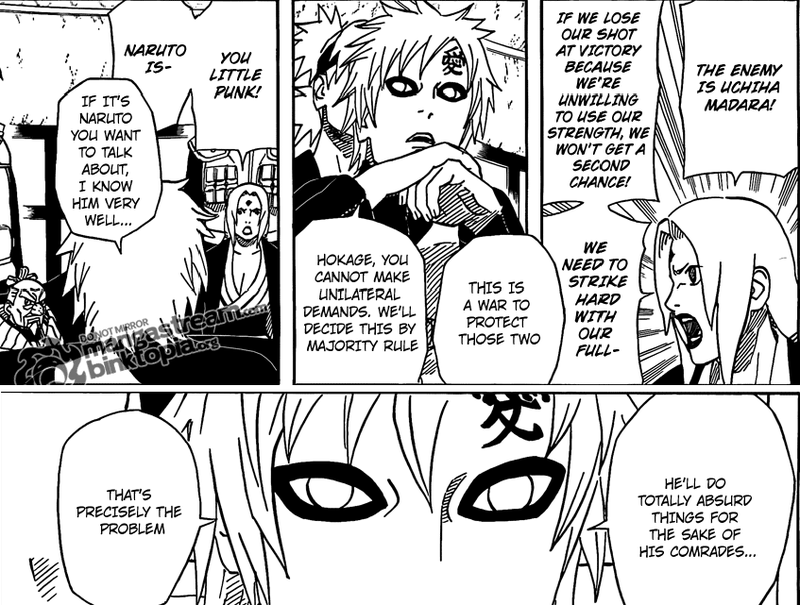 It is his response to Tsunade’s outburst regarding Naruto – calling Naruto’s actions for others “unreasonable.” Hello? Did I hear you right? Unreasonable?!? Perhaps someone should remind you, “punk,” of who saved your arse not once but TWICE; the second time while putting his arse – and his Kyuubi renter – in harm’s way by facing Akatsuki. Apparently, no one informed you of who saved Konoha while Tsunade snoozed – by putting down his physical strength and showing even more maturity than this rag-tag group of four plus one (Tsunade is the late-comer). Gee, could Naruto also be of the Kage level, too, despite your dissing of Naruto before his face-plant in the snow? Hmmmmm…. So what’s the dissing all about? Two Jinchuurki: Killer Bee and Naruto. The goal of the war is clear for Madara – to obtain the power of those two. 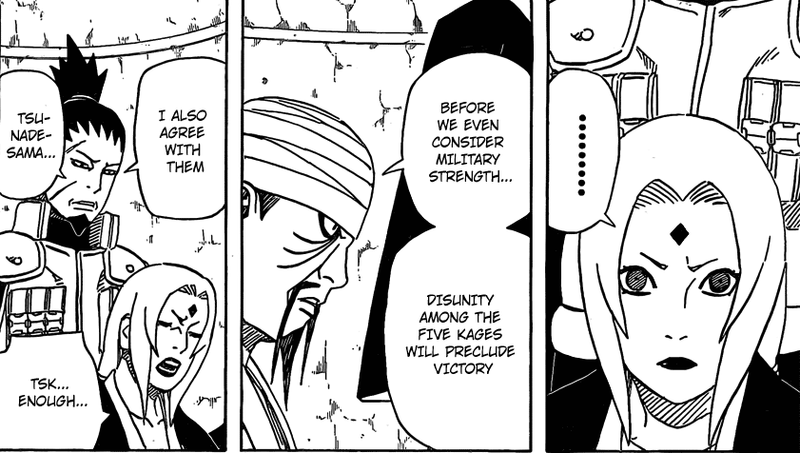 So, the goal for the five nations plus one (Land of Iron) is also clear – hide them from sight and everyone else, which is NOT what Tsunade wanted but, again, she was outnumbered. Sometimes you have to know when to throw out the bad slug...so much for helping Naruto's cause. Meanwhile, Naruto began last chapter by eating a worm-infested soup dish after being summoned to Myoboku to chat with the Senile Sage about his future life plans. He learns the “key” to his powers – to take the power but not the evil mind-control intent from the Kyuubi. Once the “go” is given, that key, in the form of a frog, is to be stored within Naruto. I’ve always wondered how Jiraiya got that thing inside of him to begin with. Perhaps this was as rough as this attempt? Autograph? Naruto’s autograph? Yes, once that frog is secure inside that belly of his, he’s sent back to where he came from: Ichiraku Ramen to the surprise of two patrons who now think he’s “the man,” the one that “makes miracles happen” (take THAT Gaara!). Naruto, the accidental celebrity. Better than that ol' Kage rank, eh? So, where does Naruto go from here,? Due to the events of the rushed and secret meeting of the Kage, Raikage, that rather large blowhard of an electrician, offers a hiding place that is supposedly secure from Akatsuki. Naruto is given a “secret mission” to this very desolate and isolated “paradise” – while accompanied by Yamato (who must be thinking he’s only a second-class ANBU by now for letting this guy escape into the snowy forest). I wonder how Yamato got back? Oh well, anyway, Yamato is onto the secret purpose of this mission: to hide Naruto along with our favorite lousy rapper/even worse singer of a Jinchuuriki, Killer Bee. And, Naruto? All he cares about is the fulfilling of the prophecy laid out by our Senile Sage: besides that upcoming battle with Sasuke, he’s supposed to be on the lookout for an octopus. Oh yeah, Yamato REALLY buys this one – NOT! Before the chapter ends, one of the funniest sequences in quite a long time happens as a squid, not an octopus, attacks the ship from Kumokagure. The ship’s captain was about to warn everyone aboard about this squid when it approaches to the horror of Yamato, but not to Naruto. Huh? All Naruto cares about is the number of legs this thing has – is it THE octopus? Last time I checked Naruto, squid had ten legs, not eight. Still it didn’t stop him and it nearly brought Yamato to the point of panic when Naruto is snatched into the air by the squid. I'm not sure that Yamato shares your enthusiasm, Naruto. Gawd, where's Yamato's sense of adventure? 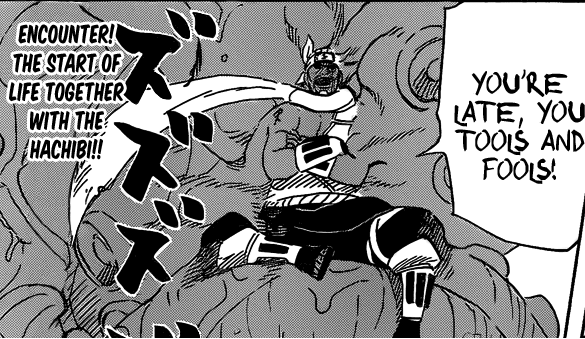 And…Naruto is still counting legs…when Killer Bee arrives in dramatic fashion to save the day. 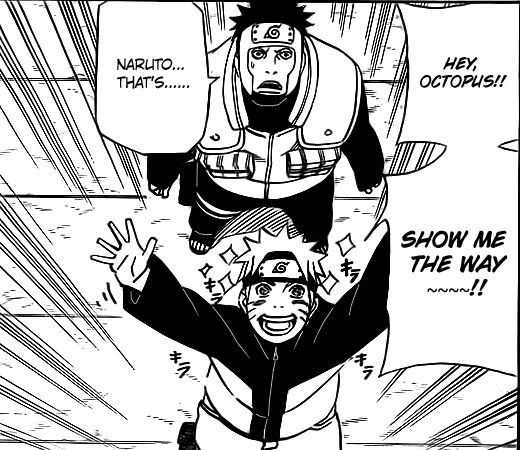 All Naruto can exclaim in pure joy is that the Senile Sage isn’t so senile and that he has “his” octopus. Yamato is probably thinking that he wants a combination of Dramamine and a good belt of Sake. Yo, "the man" is on the scene...and Naruto's overjoyed. Or, will he be? Makes you wonder why Yamato is even here, doesn’t it? I can’t imagine that Kishi could dump him like he did in the snowy Land of Iron…well, wait a minute, this IS Kishi here. And, what is Killer Bee’s role in Naruto’s life? A new Sensei/Master? A buddy Jinchuuriki? A role model for Naruto to aspire to – minus the singing? What'dya think? New Sensei? Unwelcome roomie? Strong ally? Master? Or, one helluva distraction? ~ by 綱手-Tsunades Twin on April 17, 2010. Welcome back. Hope that you enjoy your stay. Sorry for your loss. Love your breakdowns. Sorry for your loss Penny. Still, good to have you back here. Now to see what’ll happen to the site with you and Noneatencookie back here on WOM. Second, I’m curious what you make of Shikamaru’s father standing alongside Tsunade at the meeting instead of Shizune. For some reason I imagined Shikamaru’s father to be a part of ANBU, working from the shadows, yet lately he’s been focused on quite a lot. underscore: wasnt shikamarus dad their cause now they are allied? they are past the bodyguard stage, they need their military advisors their to plan a war. Penny: welcome back! after you left WRA i thought you were gone for good. Im so sorry about your mother, hope you are doing allright. anyway, great breakdown again, welcome back Penny!